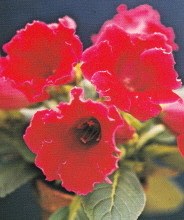 Gloxinia (Sinningia speciosa) is a flowering indoor houseplant with bell-shaped flowers and velvety leaves. There are many varieties of flowers which come in a range of colors such as blue, purple, red and white. Some may be dotted and blotched with the rims of the flowers in a contrasting color. The plant is a native of Brazil, but the plants we grow today are hybrids. Also known as the "florist gloxinia," and often given as a gift. Plants are usually purchased already in bloom and discarded when they fade. The plant is in the Gesneriaceae family and is related to the African violet. The flowers bloom in the spring, but will rebloom indoors if given a cool, dark dormant period. For decorative purposes the plant makes a great centerpiece for a table. It is even more impressive when displayed with African violets, ferns, and other lacy, green plants. 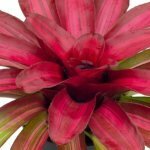 Place the plant on a shaded patio or terrace for an attractive container plant. The plant can be a little demanding, but if you choose the right culture you will have success. In the fall when the blooms start to fade and the buds stop forming, it's time for the plant go dormant. Reduce watering to about half the usual amount and remove dead flower stems. Watering: Drench the soil and let it become moderately dry, after each watering session. Be sure to keep the water off the velvety foliage. Reduce the amount of water during the dormant season. Humidity: Place plant on a wide saucer of moist pebbles and do not mist because the water will badly damage the leaves. Soil: Since the plant is related to African violet, you can use an African violet potting mix. The soil should be light and rich with peat and perlite. Fertilizer: Apply a weak (1/4 strength) balanced fertilizer solution each time you water during the growing season. Do not fertilize during dormancy. Dormancy is a state of total inactivity. The plant stop growing and loses its leaves. As dormancy approaches and leaf color fades, gradually reduce the amount of water until stems die down. Leave dormant tubers in its pot and keep in a cool, dark place for 6-10 weeks, keeping the soil slightly moist. Repotting: When the dormant period ends, repot the tuber into a larger pot with fresh moist, well-drained soil. 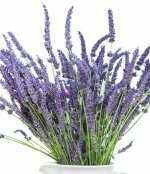 is actively growing by placing them in damp sand or seed-starting mix. You can use the dormant tuber roots and sow them in moist well-drained soil. The plant can be grown from seeds sown indoors at any time of the year. Germination takes 15-20 days and blooms in six (6) months. Grooming: Always use a soft bristle brush to clean the plant and never get water on the leaves! !